Gleaning is the collection of leftover crops both large and small, from farmers' fields after they have been commercially harvested or from fields where it is not economically profitable to harvest. Glean Thurston has expanded this definition to include the collection of surplus produce from backyards and gardens of community residents. We have fun while working hard! redirecting food, bonding with our staff and volunteers, and learning about agriculture! Our gleaning program began when partnerships were formed. In 2009 Rotary First Harvest (RFH) placed the first ‘Harvest Against Hunger’ AmeriCorps Vistas at the Thurston County Food Bank. One of those Vistas laid the foundation for the program and is still with us; today we know her as the Warehouse and Distribution Center (WDC) manager. Prior to the collaborative efforts of RFH and AmeriCorps, Thurston County had an independent coalition of community members who actively gleaned around the community with donations benefitting the Thurston County Food Bank. Eventually the program dissolved, giving way to a need within our community to organize an active volunteer gleaning group. 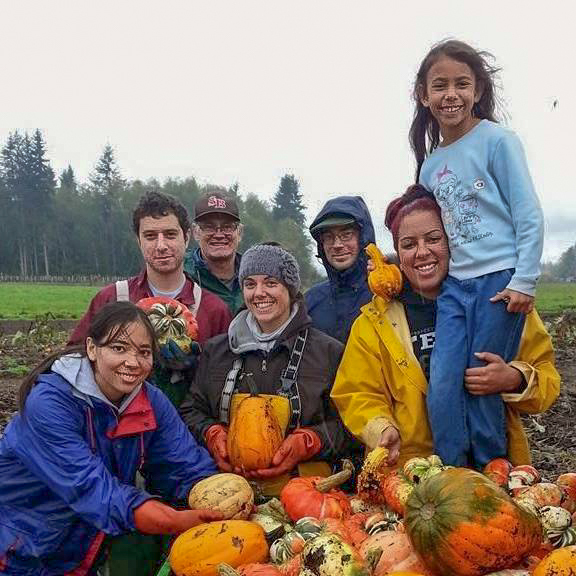 We are thrilled that you're interested in becoming a gleaning volunteer with the Thurston County Food Bank! Participating in this rewarding outdoor activity helps both to reduce food waste and to provide abundant, fresh, nutritious produce to fight food insecurity for our neighbors in need. You'll enjoy forming relationships and sharing stories in the fields, all while enjoying fresh air and getting your hands dirty for the sake of helping others.